When Lexoo was just starting out, support was simple. We didn't have many customers so could look after all the support problems ourselves. As we got more customers we decided the best way of making sure no support ticket was missed was by CCing every inbound/outbound email to the whole team. .. and that's where Front came in. 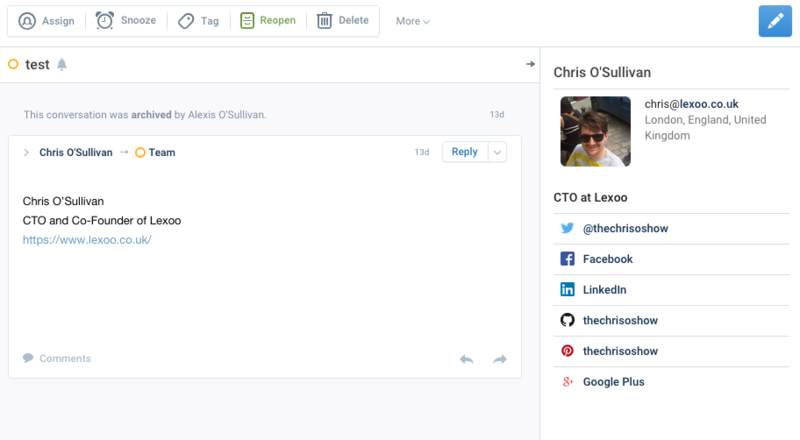 Front is a shared inbox - so members of the team all share the same email address (in our case team@lexoo.co.uk). 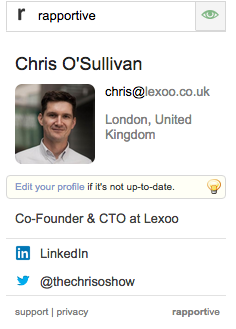 When a new email comes to team@lexoo.co.uk everyone can see it, until it's allocated to one of the team. From then on, any interactions in that email chain would be filtered to that team member within Front. When someone sends an email from Front, it automatically puts the right email signature and name against the email as well (even though the from address was still team@lexoo.co.uk). Almost instantly our lives became better. Our individual email boxes were free to cope with issues that were specific to us individually, while support calls were handled beautifully by the whole team within Front. Whenever someone went away on holiday we could mark that person as 'away' - and Front would know who would pick up their emails. Turns out to be pretty simple indeed thanks to the power of the Full Contact api. Full Contact provides a really easy api to allow for looking up an email address and returning any public information about that email address including LinkedIn, twitter, Facebook...pretty much everything that Rapportive provides! After creating a simple proof-of-concept for us to use internally at Lexoo, I realised that other Front users would probably want this functionality..
Who dat?!? is the plugin that I created for us to use at Lexoo within Front - so if you use Front, you can now try it out yourself. The only snag with using Who dat?!? is that you have to sign up for a Full Contact API key (it's free for 500 email addresses a month. If you view more than 500 emails a month you might want to sign up a larger Full Contact program). Also - I've launched Who dat?!? on Product Hunt! Check it out here.